Plateau State Governor Simon Lalong yesterday said the curfew imposed on Jos and Bukuru Metropolis was occasioned by activities of the Indigenous People of Biafra (IPOB) in the Southeast. He said the groups’ activities had immediately snowballed into the state but he had to declare the curfew to avert anarchy, bloodshed and wanton destruction of lives and property of innocent citizens. 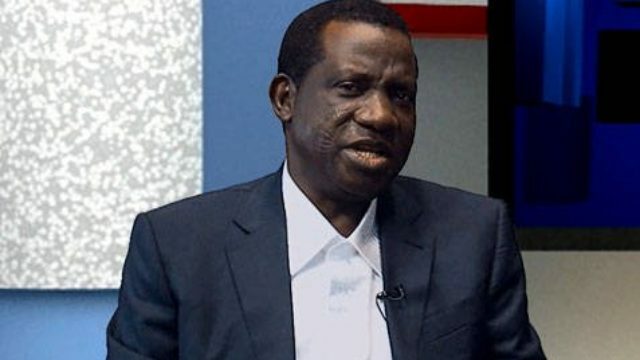 Lalong said the fact that he imposed the curfew last Thursday does not mean that the state had been plunged into crisis, adding that that prompt government intervention had saved lives in the state. “As the ugly dimension was gathering momentum and building up rapidly, it would have been more bloody if government had not imposed the curfew. I disagree with the people, especially outside the state that Plateau is no longer at peace,” he stated. The governor made the remark at the Valedictory Court Session in honour of the retiring Chief Judge of the state, Justice Pius Damulak, held at the state High Court premises in Jos. Lalong promised to upgrade the standards of judiciary in the state, saying: “We remember his contributions to life beyond legal jurisprudence. “With one eulogy after another, we are reminded of the hard work, dedication, commitment and sacrifices in the sleepless nights and family life that were spent in research and other rigorous tasks. “Today, we celebrate and remember the services of a man who has contributed his quota beyond words, in ensuring that all through his service as a legal practitioner, Judge and Head of the Judiciary, the process of Justice delivery does not fall foul of the law. “He also ensured that a profession he has lived for all his life, is not in any way made an object of public ridicule in the face of growing corruption and loss of societal values. “To achieve this, personal conviction, integrity, honour, discipline, professionalism and the fear of god, must have gone into the hours, days, weeks, months and years of service in the Bar and on the Bench. Justice Damulak, who quoted General Yakubu Gowon (rtd) immediately he was toppled in a bloodless coup, said he too had played his part, as life was a stage. He said while on the saddle, the welfare of judges was his primary concern, but that could not be pursued to its logical conclusion due to paucity of funds and urged government to try harder to better the lot of the judges. Speaking, Dean, Faculty of Law, University of Jos, Prof. Clement Dakas (SAN), who spoke on behalf of the Inner Bar, thanked God that Justice Damulak had not allowed the facts of the office to override his sense of judgment. He challenged other judges to improve their knowledge like Damulak who has LLM, by reading further. He tasked government to expedite the process of appointment of more judges to reduce the burden on the judges.